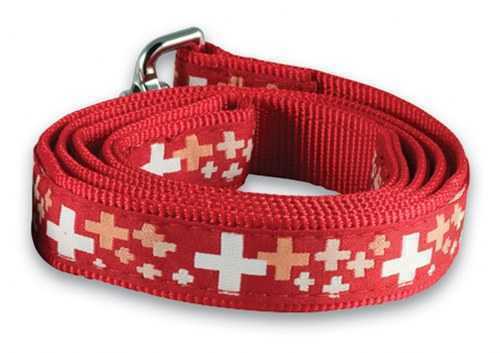 Show-off your dog on this red Swiss leash with perfect Swiss collar! Constructed of woven nylon fiber, accented with a pattern of Swiss Crosses. Collars have hi-impact plastic buckles. Smaller leash, 1/3" wide, 48" long. Service Area: New Glarus, Madison, Freeport, Rockford, Loves Park, Middleton, Stoughton, Monroe, Oregon WI, Waunakee, De Forest and surrounding communities.